Company Owners left to right: Tricia Morris, Perry Wiltsie, Jeff Wiltsie, Jim Wiltsie Jr. The latest statistics show confidence building steadily for small businesses while Wall Street staggers over plunging oil and copper prices. The oily bankers and hedge funds bet big on the frackers in West Texas and North Dakota, and some of those leveraged loans look as solid as Venezuelan bonds today. But for most of the folks we deal with on a daily basis, business looks rosy. The Detroit Auto Show has its mojo back. Cobo Hall has the pizzazz of the Las Vegas Consumer Electronics Show held last week. It’s amazing what 17 million cars can do for American machining. A family business we’ve known for four decades, Vanamatic Company of Delphos, Ohio, is celebrating 60 years in business. The Wiltsie family has figured out a way to manage 70 people, including nine family members, into a prospering continuing company. Through turbulent times, the challenges of changing technology and an evolution in attitudes about work, Vanamatic has made it work. Four siblings share the authority of leadership with three brothers holding the title of President. To an outsider it may seem like a model for managerial chaos, but when family members respect each other’s talents, it can work. A family business that works is a beautiful thing. As we watch the daily malfunction of government amidst the contentiousness of hardball politics, a functional family business seems almost magical. The funny thing is that in the competitive machining world it really does work surprisingly often. In the small microcosm of Graff-Pinkert & Co. my brother Jim and I worked with our father Leonard for 25 years. We argued frequently about the direction and tactics of the business, but the relationships were respectful. After our father died, leaving me with a slightly larger ownership in the business, it became harder to maintain balance and satisfaction. Ultimately my brother and I could not maintain the joy and momentum, and I bought out his interest in the company. But we still stay in touch and sometimes we do deals together. Now my son Noah and I work at the art of balancing family and business while keeping the father-son relationship a happy one. Noah’s buoyant attitude sops up my incipient pessimism, making the situation generally viable and fun. I thought I understood the ethos of a successful family business when my Dad, Jim and I worked together, but there is no magic to it. It takes enduring respect and a daily subjugation of ego. 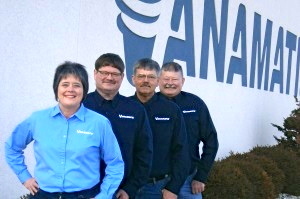 At Vanamatic four members of the third generation currently work in the firm. They are preparing for long careers. Employees average 17 years with the company. Congratulations to the Wiltsie family and Vanamatic for 60 years of success, finessing ornery 8-spindle Conomatic screw machines and modern CNC equipment to produce beautiful fittings, along with automotive and aerospace components. Mastering screw machining is no easy task, but integrating nine family members into the fabric of Vanamatic over three generations is truly the art of the family business. Vanamatic launches their new Website today. www.vanamatic.com. Question: Should a spouse or in-law work in a family business? Lloyd you get to work with your son. You are a lucky man. Nine family members running the business. They must have some interesting meetings. 3 Brothers, Mother until she passed in 98, a Daughter , Nephew and all the others are like Family. I worked for my Dad at his Play it Again Sports store from age 14-18. Hardest job of my life. He was harder on me than any other employee. Learned a great deal. Ours has been a family business for over 50 years. I agree that the secret is respect for each individual’s strengths and the willingness to let each other’s strengths make up for each one’s weaknesses. Some are better in technical areas, others in sales and marketing and others in finances, etc. The key is to set objectives and work as a team to achieve them. Everyone has to believe that the success of the company is tied to the efforts of each family member, and each family member feels he gets a fair share of the rewards based on his efforts. Perhaps as a family member gets ill or ages, they cannot contribute their full share, but again it goes back to the respect and appreciation for their past contributions. Anyway, it has worked for our family for a long time and we love our work and share our successes and failures together. I agree with Shawn’s accountant. I’ve worked at two family owned companies. The first one the two sons were idiots, morons. As soon as the dad retired they ran it into the ground. I really liked working for the dad. The second company the first and second generation worked hard to start and grow the company. The third generation, he just sat at his desk and drew a big salary. His twin sons the fourth generation, you could never find them. Coming in with hangovers or sneaking off to smoke pot. So I think family owned, first and maybe second generation after that keep your eye on them.